Do stronger patents limit the circulation of ideas? The merit of free trade is a widely debated subject. Openness is often associated with economic growth. The experiences of South Korea in the post-war period and the recent performance of China are prominent examples. 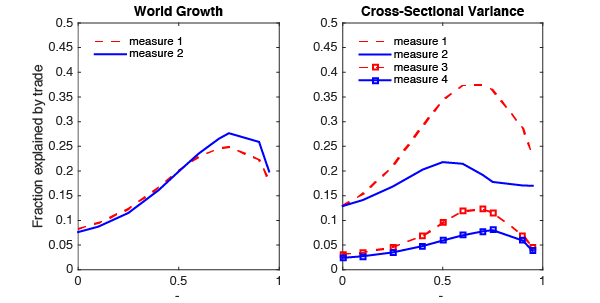 Recent empirical work using natural experiments that induce larger changes in trade costs for some pairs of countries than others – such as the decline in the cost of shipping goods by air, the closure of the Suez canal, or the introduction of the steamship – imply large growth effects (Feyrer 2009a, Feyrer 2009b, Pascali 2014).1 Yet, quantitative trade models relying on standard static mechanisms imply relatively small gains from openness, and therefore cannot account for growth miracles or large growth effects (Connolly and Yi 2015). Recent work has analysed an alternative mechanism – the impact of openness on the creation and diffusion of best practices across countries (Alvarez et al. 2015, Sampson 2015, Perla et al. 2016, Buera and Oberfield 2016). In Buera and Oberfield (2016), we model innovation and diffusion as a process involving the combination of new ideas with insights from other industries and countries. Insights occur randomly and result from local interactions among producers. In our theory, openness affects the creation and diffusion of ideas by determining the interactions from which producers draw their insights. Openness affects the set of producers that sell goods within a country as well as the set of technologies used domestically. In this context, we provide conditions under which the distribution of productivity among producers within each country converges to a Fréchet distribution, no matter how trade barriers shape individual producers' local interactions. The state of knowledge within a country can be summarised by the level of this distribution, which we call the country's stock of knowledge. Furthermore, we show that the change in a country's stock of knowledge can be characterised in terms of only its trade shares, its trading partners' stocks of knowledge, and parameters. The model is thus tractable and compatible with the widely used quantitative frameworks that have been useful in studying trade flows in an environment with many asymmetric countries (Eaton and Kortum 2002, Bernard et al. 2003, Alvarez and Lucas 2007). This yields qualitative insights, and enables us to use actual trade flows to discipline the role of trade and geography in shaping idea flows and growth. Starting from autarky, opening to trade results in a higher temporary growth rate and permanently higher level of the stock of knowledge, as producers are exposed to more productive ideas. We separate the gains from trade into static and dynamic components. The static component consists of the gains from increased specialisation and comparative advantage, whereas the dynamic component consists of the gains that operate through the flow of ideas. In an environment in which producers in a country gain insights from those that sell goods to the country, the dynamic gains from reducing trade barriers are qualitatively different from the static gains. The dynamic gains are largest for countries that are relatively closed, whereas the static gains are largest for countries that are already relatively open. For a country with high trade barriers, the marginal import tends to be made by a foreign producer with high productivity. While the high trade costs imply that the static gains from trade remain relatively small, the insights drawn from these marginal producers tend to be of high quality. In contrast, for a country close to free trade, the reduction in trade costs leads to large infra-marginal static gains from trade, but the insights drawn from the marginal producers are likely to have lower productivity and generate lower quality ideas. Our model nests at two extremes, a model of pure innovation (Kortum 1997) and a model of pure diffusion (Alvarez et al. 2008, 2014). We span these two extremes by varying a single parameter, β, which we label the strength of diffusion. β measures the contribution of insights from others to the productivity of new ideas. One striking observation is that, for either of these two extremes, if a moderately open country lowers its trade costs, the resulting dynamic gains from trade are relatively small, whereas when β is in an intermediate range, the dynamic gains are larger. When β is small so that insights from others are relatively unimportant, it follows immediately that dynamic gains tend to be small. When β is larger, insights from others are more central. However, in the limiting model as β approaches the extreme of one, a country accrues almost all of the dynamic gains from trade as long as it is not in autarky. A moderately open country is much better off than it would be in autarky, but further reductions in trade costs have little impact. As a consequence, it is only when β is in an intermediate range that the dynamic gains from trade are both sizable and would result from reductions in trade costs in the empirically relevant range. To explore the ability of the theory to account for the evolution of the world distribution of productivity, we specify a quantitative version of the model that includes non-traded goods and intermediate inputs and equipped labour with capital and education, and use it to study the ability of the theory to account for cross-country differences in total factor productivity (TFP) in 1962 and its evolution between 1962 and 2000. We use panel data on trade flows and relative prices to calibrate the evolution of bilateral trade costs, and take the evolution of population, physical and human capital, i.e. equipped labour, from the data. Given the evolution of trade costs and equipped labour, our model predicts the evolution of each country's TFP. Over time, among the many factors that would alter a country’s productivity, the model emphasises changes in openness, changing exposure to trading partners, and changes in trading partners’ productivity. Figure 1 shows some simple reduced form patterns in the data. The first panel shows the relationship between changes in openness and changes in TFP. Consistent with the model, countries that increased expenditure on imports tended to have (statistically significantly) larger increases in TFP. The second panel shows the association between the change in countries composition of expenditures and TFP growth. Consistent with the theory, there is a clear pattern that countries that increased import exposure to trading partners with high initial productivity saw (statistically significantly) larger increases in TFP. Finally, the third panel shows that countries whose trading partners became more productive tended to see increases in TFP. While this relationship is consistent with the model, it is fairly weak and statistically insignificant. The predicted relationship between trade and TFP depends on the value of b, the strength of diffusion, which indexes the contribution of insights drawn from others to the productivity of new ideas. While we provide a simple heroic strategy to calibrate this parameter (b=0.7), our main approach is to simulate the model for various alternative values and explore how well the model can quantitatively account for cross-country income differences and the evolution of countries' productivity over time. In Figure 2, we present various measures of the extent to which changes in trade costs can account for the distribution of TFP growth rates, from 1962 to 2000. The left panel focuses on the role of changes in trade costs in accounting for average TFP growth, while the right panel focuses on the fraction of the cross-sectional variance explained by changes in trade costs. In line with our theoretical results, the role of trade in accounting for both the level and dispersion of TFP growth rates is highest for intermediate values of b. The various lines in the figure correspond to alternative ways of constructing counterfactuals (see the paper for details), but the consistent message is that the contribution of trade is up to three times as large when the model allows for dynamic gains from trade. The quantitative model is particularly capable of explaining much of the evolution of TFP in growth ‘miracles’, accounting for over a third of the TFP growth in China, South Korea, and Taiwan. In our work we provide a tractable theory of the cross-country diffusion of ideas across countries and a quantitative assessment of the role of trade in the transmission of knowledge. Of course we omitted many channels that may complement or offset the role of trade in the diffusion of ideas. Chief among these are FDI. Indeed, the structure of the model can be naturally embedded in quantitative models of multinational productions (Ramondo and Rodriguez-Clare,2015). We see these as exciting avenues for future research. Donaldson, D (2015), “The Gains from Market Integration,” Annual Review of Economics. Eaton, J, and S Kortum (2002), “Technology, geography, and trade”, Econometrica, 70, 1741–1779. Frankel, J A, and D Romer (1999), “Does trade cause growth?”, American Economic Review, 379–399. Pascali, L (2014), “The wind of change: Maritime technology, trade and economic development”, Manuscript. Perla, J, C Tonetti, and M Waugh (2015), “Equilibrium Technology Diffusion, Trade, and Growth”, NBER Working Paper, 20881. Earlier work by Sachs and Warner (1995), Coe[SH5] and Helpman (1995), and Frankel and Romer (1999) suggested a strong relationship between openness and growth, although Rodriguez and Rodrik (2001) subsequently argued that many estimates in the literature suffered from econometric issues including omitted variables, endogeneity, and lack of robustness. More recent contributions to the literature discussed in the first paragraph have developed strategies to overcome some of these issues. See also Lucas (2009) and Wacziarg and Welch (2008), and Donaldson (2015) for a review of the literature. See Keller (2009) for a recent review of this empirical literature, considering alternative channels, including trade and FDI.